This page is also the main Vibe login page. Users with Vibe usernames can log in to their personal workspaces, and from there they can access any other locations where they have been granted access. If you are using Novell Access Manager to provide single sign-on functionality. For more information about Novell Access Manager, see Configuring Single Sign-On with Novell Access Manager in Advanced Installation and Reconfiguration in the Novell Vibe 3.4 Installation Guide. If users are accessing the Vibe mobile interface. For guest users to access the Vibe site, they must access the full user interface from a browser. For more information about accessing the Vibe mobile interface, see Using Novell Vibe on Your Mobile Device in the Novell Vibe 3.4 Advanced User Guide. As the administrator, you can choose whether you want people who do not have Vibe usernames to be able to access information on the Vibe site as the Guest user. For example, a government organization such as a city might give Vibe user accounts only to key city knowledge workers. However, it is critical that other city workers and regular citizens also access the site to see a listing of upcoming events, read city news, report complaints, and so forth. As a Vibe administrator, you can use the Guest User workspace as a place to present information to non-registered Vibe users. Any user who knows the Vibe site URL can access the Guest workspace. The Relevance Dashboard in the Guest workspace displays only the information that the Guest user has been specifically granted access to see. A Guest user can find out what is accessible on the Vibe site by clicking the Search Options icon , selecting Places, then pressing the Spacebar. If a Guest user uses the Search feature, the only information returned is information that the Guest user has been granted access to see. When a Guest user adds a folder entry, the entry form requests the user’s name and e-mail address. This information is displayed like a signature when the folder entry is viewed. Providing the name and e-mail address is optional. If you grant Participant rights to the Guest user, people who access the Vibe site as the Guest user can modify and delete entries and comments posted by other people who have accessed the Vibe site as the Guest user. Under System, click Configure Guest Access. Make sure that Allow Guest Access is selected, then click Close. Even though this option is selected by default, the Guest workspace is initially inaccessible because the default user access control settings do not allow access. Click Close again to close the Administration page. Click the Workspace tree icon , expand Home Workspaces, then click Personal Workspaces. Begin typing Guest in the Entry field, then click it in the drop-down list. The Guest user’s personal workspace is displayed. Click Workspace > Access Control. Ensure that no is selected in the Inherit role membership section. If it is not, select no then click Apply. Click Add a User, start typing Guest in the Add a User field, then click Guest when it appears in the drop-down list. This adds Guest as a new row in the Access Control table. 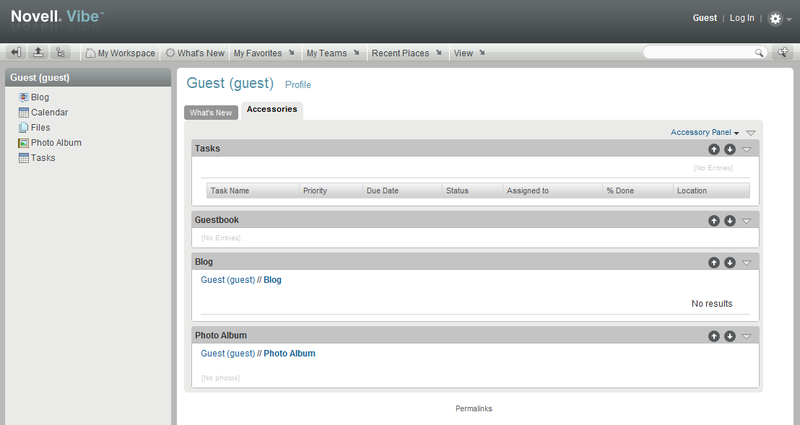 Visitor: The Guest user can read entries and add comments or replies in folders in the Guest user workspace. Participant: In addition to Visitor activities, the Guest user can also create new entries, and modify or delete his or her own entries. For more information about the additional access control options, see Controlling Access in the Novell Vibe 3.4 Advanced User Guide. Now, when people access the Vibe site who do not have usernames, they are admitted as a Guest user and see the What’s New page (only items that the Guest user has access to see are visible). 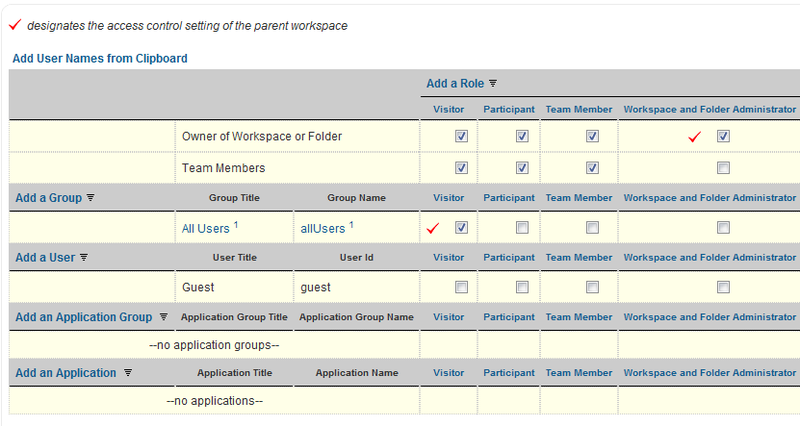 Guest users can also access the Guest User workspace by clicking My Workspace. Set up the Guest user’s personal workspace with whatever information you want to present to people who visit your Vibe site without logging in. For general suggestions on creating useful workspaces, see Creating Custom Workspace Views in the Novell Vibe 3.4 Advanced User Guide. 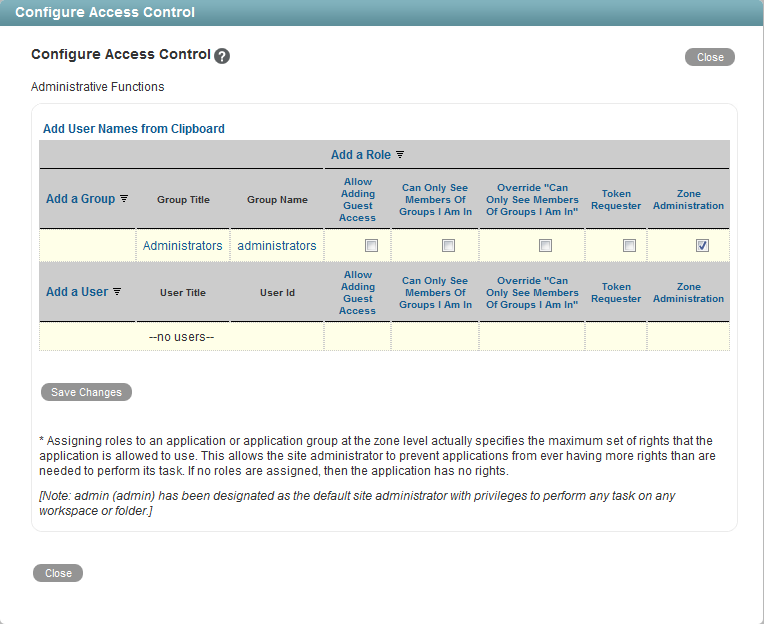 (Conditional) If you want the Guest user to be able to access content elsewhere on the Vibe site, add the Guest user to the Configure Access Control page for those workspaces or folders. You can also enable specific Vibe users in addition to the Vibe administrator to grant Guest access to locations in your Vibe site, as described in Section 5.4.5, Enabling Individual Users to Grant Guest Access throughout the Vibe Site. Notify people who might be interested in accessing your Vibe site about your Vibe site URL. (Conditional) If you want information on your Vibe site to be searchable on the Internet, see Section 5.6, Allowing Web Crawler Access to Your Vibe Site. If you’re not satisfied with the What’s New page being the default home page for guest users, you can configure the Guest User workspace or a different workspace to be the default home page, giving you complete control over what guest users see when they first access the Vibe site. For information on how to change the default home page for guest users, see Section 4.3.2, Setting a Default Home Page for Guest Users. A basic Vibe site consists of a single zone. Novell Vibe allows you to set up multiple zones in a single Vibe site. This feature is not available in Kablink Vibe. For more information about zones, see Section 17.0, Setting Up Zones (Virtual Vibe Sites). Click Add a User, start typing the user’s name, then select the user from the drop-down list to add the user to the Access Control table. Select the check box in the Allow Adding Guest Access column. Repeat Step 4 and Step 5 for each user who you want to be able to grant Guest access to locations on your Vibe site. Notify the users who are allowed to grant Guest access. As the Vibe site administrator, you can create a report of all locations on the Vibe site that the Guest user can access. For instructions, see Section 28.2.3, User Access Report.